CD review: "The Brasil Project Vol. 2"
This review first appeared in the Sept. 3, 1993 issue of the North County Blade-Citizen (now North County Times). It's an interesting combination  lead harmonica and Brazilian jazz  but in veteran harpist Toots Thielmans' hands, it works well. This is smooth, romantic music, closer to Sergio Mendes or Djavan than the syncopated dance music that came to the states from Brazil in the 1980s and '90s. 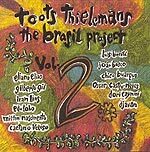 Despite his Belgian upbringing, Thielmans has a solid feel for the Brazilian music; his harp playing has a sweet sound, like early Stevie Wonder, that lends itself to the romantic sounds of composers Antonio Carlos Jobim and Milton Nascimento, among others.